Feeding Sand Boas in captivity is usually pretty straightforward. Most people that have problems getting Sand Boas to eat are failing to provide appropriate housing and/or temperatures for their snakes. 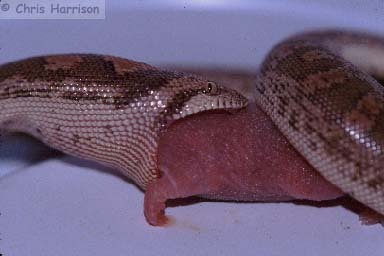 Most adult Sand Boas eat commercially available rodents. However, most Eryx prefer small food items not much larger in diameter than their bodies. Many also prefer nestling rodents to adults, for example, a large E. tataricus I had consistently refused dead or alive adult mice, but readily consumed smaller (crawler) mice and crawler rats, many of which were larger than the adult mice I offered! Often a freshly killed mouse is acceptable to a snake that refuses previously frozen and thawed food. If you try this for a while your snake may get used to feeding on dead prey and start taking previously frozen animals. Sometimes warming a thawed mouse (put it in a watertight plastic bag and submerge it a few minutes in warm water) helps. Sometimes offering dead rodents with forceps will be acceptable. To encourage the snake, either wave the rodent gently in front of the sand boa or alternatively, gently press the food item up against the lower part of the mouth opening for a second. Sand Boas usually prefer to eat at dusk or after dark. While this is the best time to offer food, you should never leave live rodents in a cage overnight with your snakes. I have recently received a couple of suggestions from Sam Mitchell. He has had success scenting mice with dead chicks (maybe chicken soup would work as well as it does for pythons?) and he has also created false rodent nests with an overturned deli cup (with lid on) or similar container and an entrance tube. He usually places the false nest on top of the litter and puts some of the dirty rodent cage shavings in the container to make the container more attractive to an investigative snake. Sam also suggests feeding snakes that insist on feeding in their cages by putting a food item on a paper towel to prevent shavings, etc., from sticking to the food item. Babies of some species are as easy to care for as the adults. 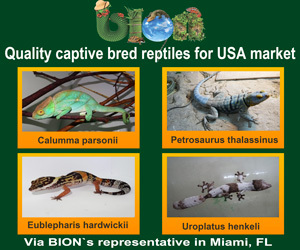 This is the case with the species that have larger babies, including E. colubrinus, E. conicus, and E. johnii. These larger babies are born big enough to take a standard sized pink mouse. Some of the smaller species have very small babies. These small babies can be problematic, not only because it is hard to find very small pinkies, but also because many of these species appear to be lizard eaters in the wild. See individual species accounts for specifics on this. I try live and dead pinkies. I try feeding the babies in snake bags or very small dark containers. Frequently, isolating them in a deli cup with a dead pinkie is all that it takes to get them to start. Scenting pink mice is also effective. This can be done by rubbing a pinkie on a lizard. It works best if the pinkie is wet first then rubbed on the lizard. I have also had good success with some snakes by wetting a small piece of shed lizard skin and sticking this on the forehead of the pinkie. Some species can be tricked into lunging at a pinkie. This is done by getting the baby snake excited with a preferred food item (such as a lizard) by dragging that food around the cage. When the baby snake starts actively pursuing the prey item and lunging for it, keep the prey item out of reach and quicky substitute the pinkie in front of one of the lunges. This trick works better if the pinkie is scented first and is surprisingly effective with some species of Sand Boa (and also by the way with baby Hognose Snakes Heterodon sp.). Some people find that washing a pinkie with liquid soap or dishwashing detergent before offering it may stimulate a feeding response. I haven't ever tried this, but some of the Gray-banded Kingsnake (Lampropeltis alterna) breeders I know swear by this technique. Apparently, some soaps work better than others, so try a couple (Ivory soap seems to be a particular favorite!). For some species, it may be necessary to brumate the young snakes before they will feed. For babies that are born late in the year, just keep them cool for a few weeks and allow them to go into brumation. Often they will emerge from several weeks of brumation ready to feed. As a last resort, I hold the snake behind the head and place a small pinkie in the snake's mouth and put it down gently to see if it will swallow the pinkie. Sometimes you have to do this several times before the snake will swallow the pinkie. Some snakes will not respond to this method and as it is stressful, I usually give up after 5 tries. For more ideas on starting picky feeders see the excellent article by Tony Mills (1990). Mills, T. 1990. To scent or not to scent (techniques for feeding baby snakes). The Vivarium 2(3):8-27.